Remember when Wile E. Coyote tries to trick the Roadrunner into flattening himself (it’s a him, right?) 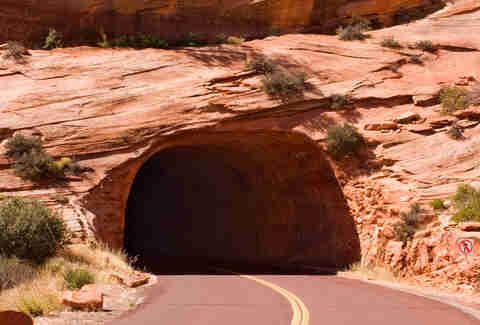 against a canyon wall by painting a tunnel? 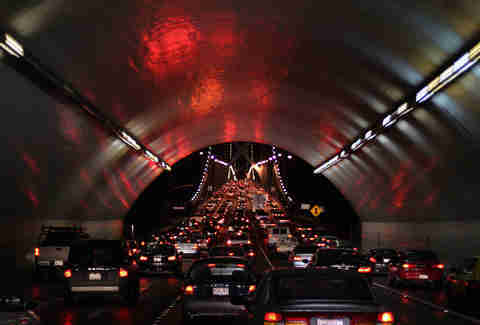 That’s basically the Zion-Mount Carmel Tunnel except for the whole fake thing. I promise it’s not just a painting. Leave it to the country that designed the dopest passports in history to craft a tunnel that looks like something out of Tolkien. 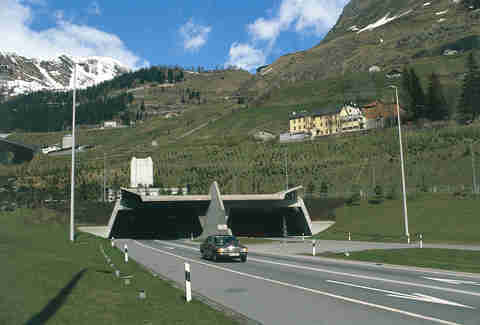 It’s 15.2 miles long, which makes it the longest roadway tunnel in the world, though those crafty Norwegians installed three rest areas highlighting natural cave formations along the tunnel’s route. Oh, and those rest areas? They’re lit a glowing blue and red to imitate the sunset. Makes me think the Holland tunnel could use some flourishes. 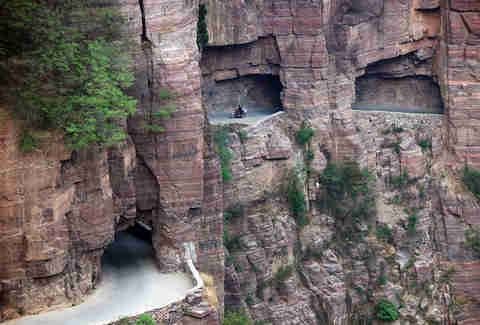 Thirteen villagers carved 3/4 of a mile into the side of a mountain because their tiny hamlet was cut off from the rest of the world save for a breakneck climb up a 700-step staircase. It took them five years. Thirteen villagers. With hand tools. I don’t know if that’s more impressive than the sheer natural beauty of the Taihang mountains but, I mean, it’s close right? 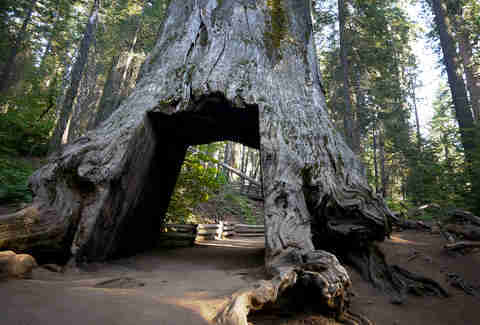 The iconic Wawona Tree tunnel may not be standing anymore -- it finally collapsed during an especially rough winter in 1969 after, uh, 2,100 years -- but you can still squeeze through the fallen Tunnel Log in Sequoia National Park in central California. An 8-foot-tall tunnel bored through the body of a 2000-year-old tree may not be one of the most daring feats of engineering on our list, but it gets bonus points for making you grapple with your own mortality. 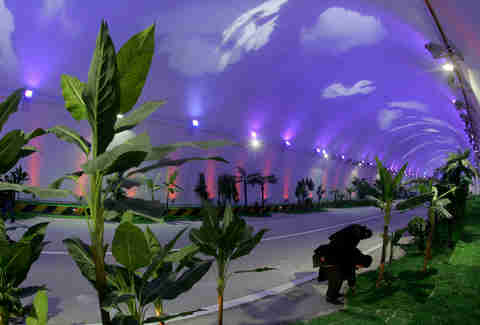 Anything that breaks up the monotony of driving half an hour through a pressurized tube is welcome, so consider the Zhongnanshan tunnel, which is lined with, uh, lifelike palm trees and tropical grass. American engineers could also take a lighting cue from their Chinese counterparts: the entire 11.2 mile length is lined with projected clouds and mellow lighting. I could sit here and tell you all about the cost overruns and political skullduggery and interminable delays surrounding this massive feat of infrastructure, but that’d take forever. 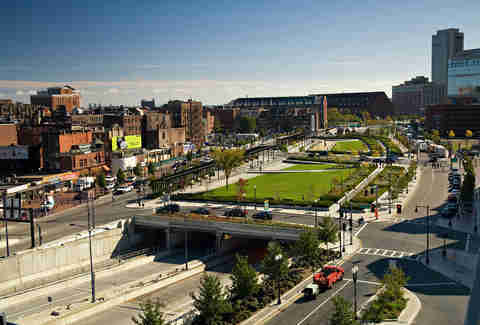 Instead just consider this: the team in charge of the Big Dig took an entire interstate highway (I-93) and put it underground. They opened up an entire section of Boston that had previously been demarcated by massive concrete barriers -- essentially taking a Robert Moses and making it a Jane Jacobs. It may have been a 20-year headache, but at the end of the day the Big Dig is one of the most ambitious engineering projects in American history, and it worked. 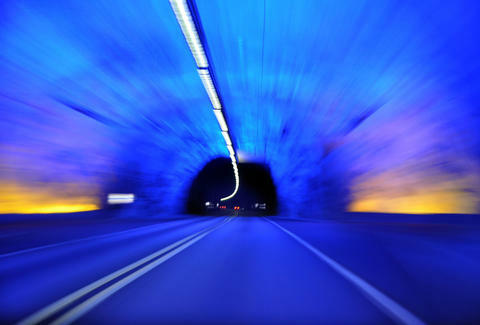 This 5.6 mile tunnel looks like something out of a Cowboy Bebop episode. (For all you non-nerds out there, think of it as The A Team meets Blade Runner.) It’s a futuristic combination of architecture and infrastructure that would only fit in a city like Tokyo and it’s not just a tunnel: the Aqualine actually juts out 2.7 miles into Tokyo Bay, creating a stark image of a highway that simply ends in the middle of the sea. 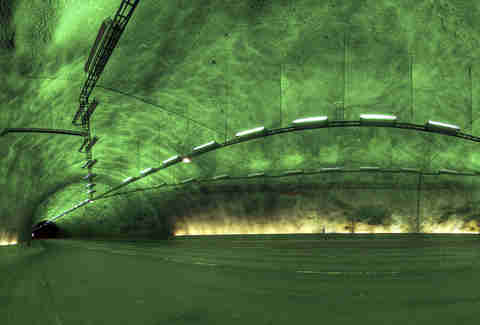 A tunnel in the Platonic sense: efficient, pragmatic, a way to bend the laws of nature to the talents of mankind. Isn’t that what the Swiss are all about? It’s a year-round, 10.5 mile connection between central Switzerland and Milan to the south -- a path that was traditionally blocked by snowfall during the winter months. What’s a tunnel but a giant hole in the ground and a massive, infinitely complex engineering project that would probably make your brain explode if you tried to understand it without a dozen years of education and professional experience? 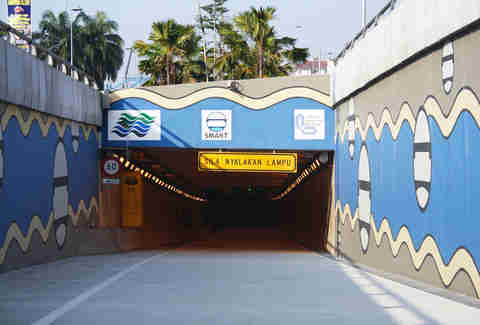 The team behind SMART Tunnel added another layer to that equation by making their project pull double duty: during the monsoon season the 6 mile tunnel acts as a giant storm drain, creating a much needed bulwark against flash floods in the Malaysian capital. I must have driven through this tunnel between Oakland and San Francisco hundreds of times and never noticed how freakin’ huge this thing is. At 525 feet long, it’s still the largest single-bore tunnel in the world and was finished all the way back in 1936 when I’m pretty sure they had to dig it out with pick axes and willpower. 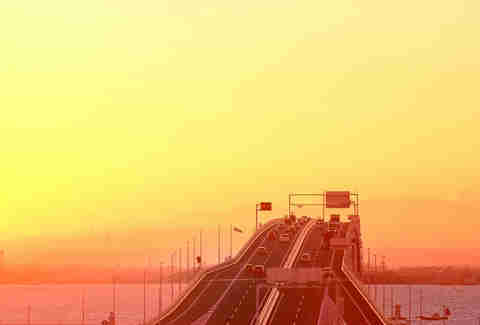 Fun fact: apparently it was cheaper to dig through the island than to just build a giant bridge connecting either side of the bay.